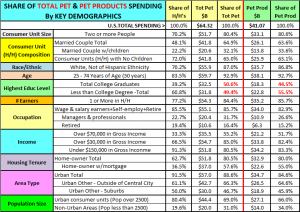 U.S. Pet Spending Demographics: The “Ultimate” Pet Spending Household and…more! It’s early in the New Year. 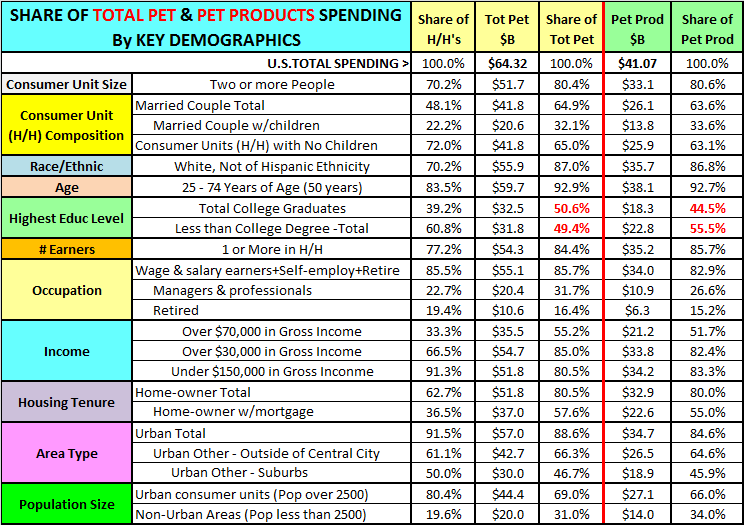 Let’s have a little fun by taking a look at the demographics of the “Ultimate” Pet Spending Household. If there were more of these, Pet Spending would be in the stratosphere. The “Ultimate” Pet Spending Household consists of 3 people – a married couple with an 18+ year old child, still living at home. Mom and Dad are in the 55 to 64 age range. They are White, but not of Hispanic origin. At least one of the Parents has an advanced College Degree. Everyone works in the H/H. Mom and Dad are “managers” or professionals. Their child also works, at least part time. They’re doing OK with a total Household income in excess of $120K. They own their home or to be more accurate, share ownership with the bank. They live in a rural area (under 2500 population) in the Midwest or Western U.S., but it is adjacent to a good sized metropolitan area. This gives them plenty of space for their companion animals, but they are still close enough to commute to the City for work, shopping and entertainment – the benefits of the Urban environment. The Chart below details the specifics along with how the Total Pet Spending of each of the demographic factors compares to the National Average. There is also a chart on “Pet Products” Spending – just pets, food and supplies – no Veterinary or other services. The “ultimate” households are similar, but there are also some distinct differences. Take a look. The Parents in the Top Pet Products Spending Household are younger – 45 to 54 age range. They still have 3 children at home and the oldest is not yet 18. They are well educated and make over $120K per year like the “Total Pet” group, but they are self-employed. They are firmly anchored in the Midwest, but not near any big metropolitan area. They live in a truly rural environment. Our modern world has made it much easier to work out of your home. These two “ultimate” households would be easy to sell to but there are not enough of them. Let’s look at where the bulk of the business is going – the biggest market share by key demographics. The chart below compares the share of Consumer Units (H/H’s) to the share of Total $ and Total Pet Products $ for Key Demographic measures. The goal was to bundle the subsets within a demographic category, like gross income until we reached a dominant market share of 80%. Sometimes this is simple, sometimes not. There are also Key Subsets listed for certain Demographics. You will note a similar pattern in Total Pet and Pet Products. Differences will be noted in the comments. Income – This is usually the first demographic that anyone looks at and it is generally true that increased income results in increased pet spending. The midpoint (50%) is generally recognized as $70K. This is substantially correct although the over $70K group spends more on services. To get to the 80+% market share, you have to go down to the over $30K level. The upper 2/3 of the households in income spend over 80% of the pet $. You can also get to 80% by grouping everyone who makes less than $150K. However, this requires 91% of the total households. Pet ownership is popular across all income levels but as expected, there is a great disparity in spending between the high and low ends. # Earners – This is an easy one. To get to the 80+% level, someone in the house has to have a job. It is interesting to note that 23% of U.S. households have no earner but they still account for about 15% of Pet Spending. I’m sure the retired group is a major factor. Occupation – To reach 80% market share of spending you have to include all wage & salary earners, self-employed and retired people. The Managers/Professionals spend the most money of any group, especially on services. However, “retired” people are second. This is an important and growing group. Race & Hispanic Ethnicity – White, non-Hispanics make up 70% of the consumer units in the U.S. but account for 87% of both the total pet and pet products expenditures. (Note: Native Americans and Pacific Islanders are included in the white grouping). African Americans, Asians and Hispanics account for 30% of the households but only 13% of Pet Spending. This is a situation which should be reviewed. Age – We should note that the 55-64 age group has the largest share of Total Pet Spending and the 45-54 group is the Pet Products winner. Together they account for over 40% of Spending. However, there is significant pet spending in all ranges. To get to the 80+% level in spending share for either Pet Products or Total Pet you have to include everyone from 25 to 74 – 50 years. This reinforces that Pet ownership is a commitment for a lifetime. Highest Education Level – It’s true that College graduates spend more per household and have a slightly larger share of Total Pet $ (51%). However, when you look at Pet Products spending only, the less than college degree group moves to the top at 55%. The subgroup with a Bachelor’s degree spends 25% of all Pet Products $. However, the subgroup with a High School diploma or less (and no college classes) actually accounts for 26%. Pet ownership and spending encompasses all education levels. Consumer Unit Size – Another easy one. 70% of U.S. households consist of 2 or more people. Although single people definitely have pets, the 2+ group is more likely to have a pet…and definitely spends more. 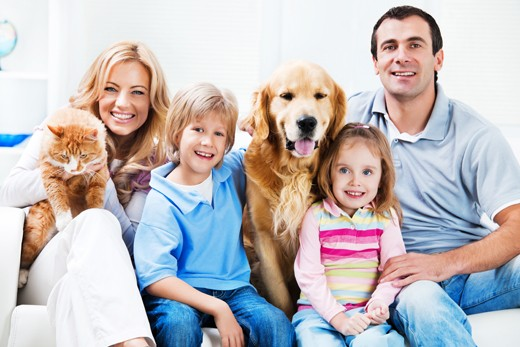 Consumer Unit Composition – One of the industry stereotypes is the married couple with their children – both human and 4 legged. To some extent this is true as 48% of U.S. households are married couples and they spend over 60% of Pet $. Only 22% of U.S. households are married couples with children. They do spend more on their pets but still only account for 1/3 of total Pet $. On the other hand, 72% of U.S. households have no children at home and their share of Pet spending is also over 60%. The biggest key to pet spending seems to be to put 2+ people together in a consumer spending unit. This = 80% Pet $. Housing Tenure – When you own your home, you have a “permanent” residence and you set “most” of the rules for having pets (can’t forget HOA’s). 63% of Americans own their own home and they account for 80% of Pet Spending. Home ownership is a key factor in both Pet Ownership and Pet Spending. Type of Area – 91.5% of American Households are within defined Metropolitan Statistical Areas (MSA’s) so it’s not surprising that over 85% of Pet Spending comes from this Urban environment. However, the Central Cities have lower pet ownership and spending. The lion’s share (2/3) of the $ come from “other urban”, which consists of the suburbs and rural areas included in the MSA’s. The largest share goes to the stereotype – the suburbs – with 50% of all U.S. households and almost 46% of Pet Spending. However, it also should be noted that the “rural” areas (under 2500 population) included in the MSA’s account for 11% of all U.S. households and 19% of Pet spending. These folks spend some $ on their pets. Population – Urban environments (over 2500 population) generate the largest share of Pet $ – 2/3. However, you just can’t discount rural households which generate 1/3 of total pet spending from only 20% of the total households. As you get more space – moving from the central city to the suburbs to “the country”, you spend more money on your pets. Region – Pet Spending is dependent upon # of H/H’s, but the Midwest and West perform slightly better. Pet ownership and spending is obviously widespread across U.S. Households. Just for fun, here is one thought on the minimum Household Demographic “requirements” to “Max Pet Spending Market Share”: 2+ people living together; who own their own home in an urban area, but not in the “city”; at least one person works or has retirement earnings; the household income is over $30K and they are White, but not of Hispanic ethnicity. That’s a lot of people, a lot of pets and a lot of spending! In a follow up, we will look at how the demographic groups are performing compared to the number of households…earning their share…and which ones are the big gainers…or losers.